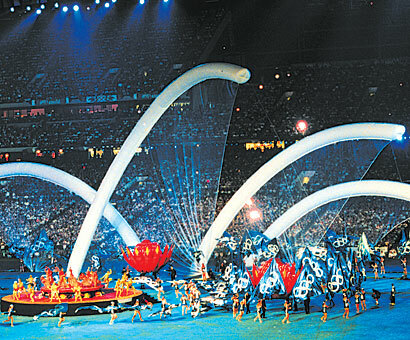 In the Closing Ceremony, the Olympic Flag is presented to the Mayor of the next Olympic city and usually this segment is accompanied by a cultural performance. In the closing ceremony of the Atlanta 1996 Olympic Games, Ric Birch and Spectak produced the Flag Handover Ceremony on behalf of Sydney. The short but action-packed performance was hailed by USA Today as the highlight of the Atlanta Closing! It was an opportunity for Australia's emerging indigenous performers to be seen on a world stage, where the stars of the Bangara Dance Theatre appeared with almost 200 other performers and dancers from Australia under the creative direction of Stephan Page. All the performers and most of the creative staff were aged less than 30 - a deliberate policy of Birch's to reinforce the image of Australia as a relatively young country and to promote international experience and exposure among the cast and crew. The handover was a sneak preview to the Ceremonies that followed four years later.